“We have a situation where we have our inner cities African Americans Hispanics are living in hell.” [sic] —Candidate Donald J. Trump, First Presidential Debate, Sept. 26, 2016. —President Donald Trump, commenting on Sutherland Springs mass murder, Nov. 7, 2017, Seoul, South Korea. —Richard Florida, “Why Cities Matter,” City Lab, Sep. 15, 2011. Metropolis Magazine: “10 Best Cities,” Sept. 6, 2016. 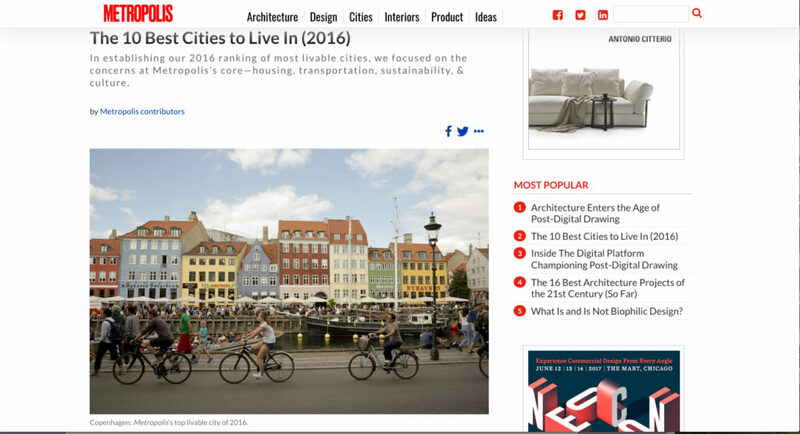 Copenhagen was deemed its top livable city of 2016. “Greatest Cities of the World, BBC six-part documentary, Griff Rhys Jones, Host, 2008. The “great” and the “livable” each has its own discrete metrics. Some cities show up on both lists, but for the most part, the rankings gravitate towards different locales. 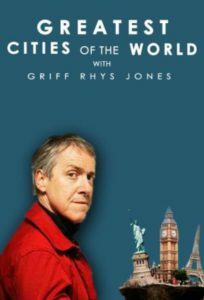 In 2008, the BBC released a six-part documentary hosted by the Welsh comedian Griff Rhys Jones, on the greatest cities on the planet: London, Rome, Paris, New York, Sydney, and Hong Kong. In their most recent list Forbes magazine identifies the most “influential” cities on the planet with exhaustive technical data to support their findings. Metropolis magazine attempts to avoid the livable/great debate by assembling a list of the 10 “best” international cities based their “core” urban values: “housing, transportation, sustainability, and culture.” In the end, however, these are really “livability” traits. The moniker “livable cities” gained currency amidst the embers of the urban renewal of the 1960s and 70s. It took off in the 1980s, and then again in the 1990s. During The Age of Aquarius, however, “renewal” soon faced opposition as it invariably equated to neighborhoods either razed, or ramrodded with roadway, by government fiat. Google Ngram. 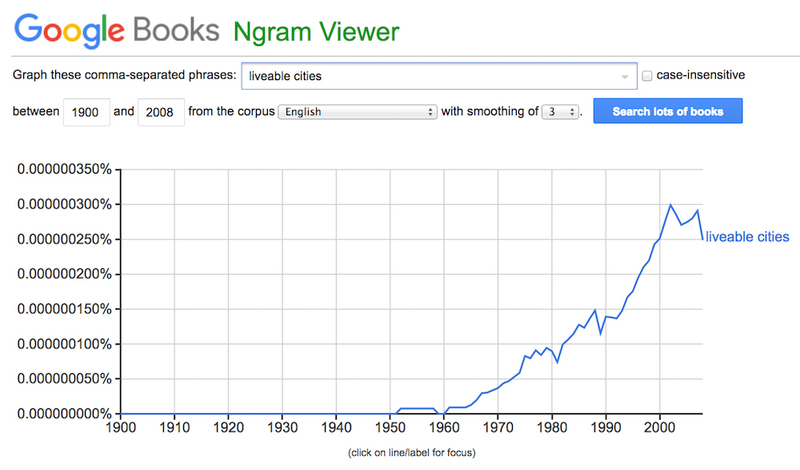 Search Term: “Livable Cities,” from 1900 to 2008. Accessed Nov. 18, 2017. In cities as varied as Philadelphia, Buffalo, Detroit, St. Louis, and Knoxville, swaths of historic fabric were eradicated in favor of bold visions of newness and efficiency–monumental in scale and homogeneous in character. Getting from one place to another as quickly as possible mattered far more than the places in-between. In Philadelphia and St. Louis, some of what was lost was replaced by national landmarks of specious quality: Independence National Historic Park and Jefferson National Expansion Memorial, respectively. Much of Detroit’s scar tissue is still visible across thousands of acres of a vacant grid work; spectral buildings line vacant streets absent normative human occupation. 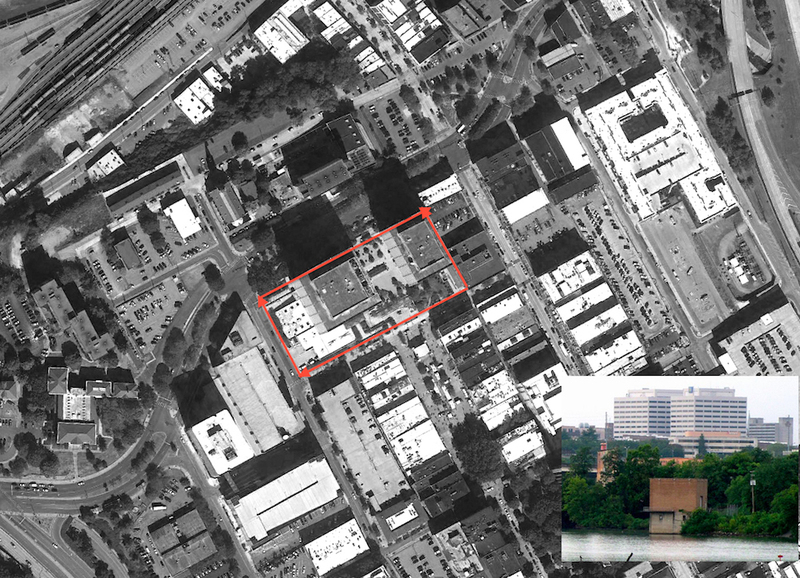 Aerial View, Summit Hill Drive, Market Square, TVA Tower Complex, Knoxville, Tennessee. Courtesy of Google LLC. (Insert: TVA Towers, TVA’s headquarters in downtown Knoxville, overlooking the Tennessee River. Photo: Brian Stansberry©/Creative Commons. Here in Knoxville, the damage was profound; the TVA office complex and the contemporaneous Summit Hill Drive are some of the most egregious adhesions from botched urban surgery. The former required the destruction of the remarkable collection of buildings along Knoxville’s Wall Avenue; the latter, the razing of the city’s public library (c. 1915), that prompted the founding of Knox Heritage, along with the erasure of the urban core’s historically black commercial district, the site of Knoxville’s Red Summer riot of 1919. As governments and private investment converged to make our cities less humane, academics increasingly focused on understanding the quality of livability. For almost half a century, the Making Cities Livable LLC group has made a living out of the livable cities concept, which gained momentum of late owing to it sharing so much DNA with New Urbanism. 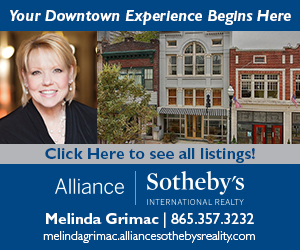 Locally, the East Tennessee AIA has recognized livability as a central issue of their membership, evinced in their sponsoring the public forum I referred to in part 1 of this article. Conversely, during the 2016 presidential campaign, we heard regularly from he-who-could-never-be-elected about how un-livable American cities were. 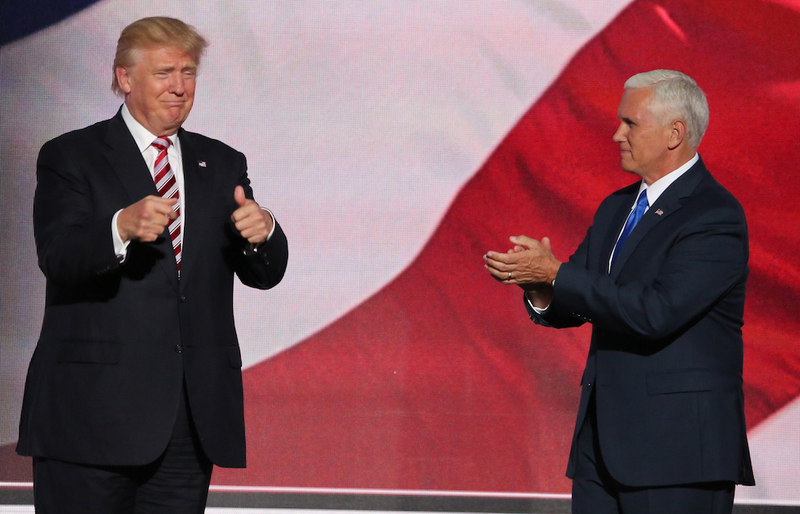 Candidate Donald Trump and Vice Presidential Candidate Mike Pence, after receiving the nomination at RNC Convention, Cleveland, Ohio, July 2016. At the Republican National Convention, he claimed: “Americans watching this address tonight have seen the recent images of violence in our streets and the chaos in our communities.” Weeks earlier, at the final presidential debate he offered: “Our inner cities are a disaster. You get shot walking to the store.” Who knew Mar-a-Lago’s West Palm Beach neighborhood was so dodgy, not to mention Bedminster, N.J. That said, all of the post-election analysis indicates that Trump’s intentional hyperbole resonated most effectively with those most distant from daily urban life, least familiar with the information he misrepresented, and most likely to vote. During a news conference with President Jose Maria Aznar of Spain, commenting on the inadvertent death of a Spanish journalist by American forces in Iraq, President George W. Bush famously responded: “War is a dangerous place….” One takes one’s epiphanies as they come, where they come. “Dudley Street, The Seven Dials,” first published in “London, a Pilgrimage,” 1872, Gustave Doré. (Photo: The Victorian Web.) Insert: Late 16th- early 17-th century woodcut, Emptying of night soil. Good manners in Elizabethan London required one to yell “Gardy-loo”, before tossing the morning contents of one’s chamber pot out the wind, to warn any passersby on the street below. This practice continued through the end of the 19th century. Our 45th president’s fictional urban nightmares are of different kind and magnitude, however, than Mr. Bush’s grievous understatement. 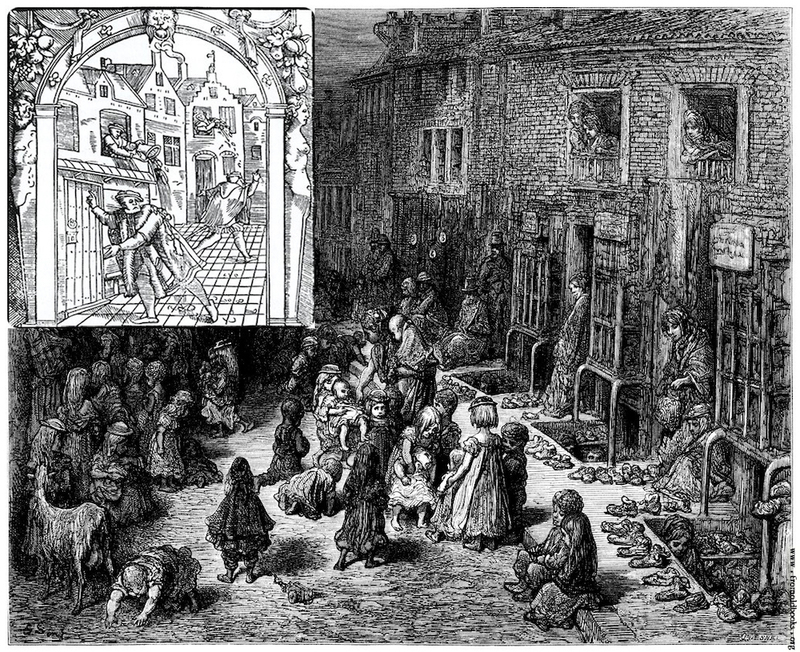 The greatest cities throughout history always have been occasionally dangerous places in which to live, particularly before modern sanitation and antibiotics. In ancient Rome, for example, one of the most commonly adjudicated civil actions were occasioned by the careless emptying of chamber pots (out one’s window), splashing the tunic of passing citizens. This sort of problem persisted well into the 18th century. Cities have always been physically dangerous as well. It stands to reason that we tend to find the most crime and disease amidst the densest population centers; criminals need someone to rob, pathogens need a host. Moreover, what we understand today as a municipal police force is a relatively recent 19th-century invention, including the first large-scale municipal force, aka Scotland Yard, in London (1829). It’s easy to appreciate, therefore, why the Medici commissioned Giorgio Vasari to construct an elevated enclosed passageway connecting their place of business (the Uffizi) with their palace and gardens across the Arno (the Palazzo Pitti). There was far more to fear in Florence in the late 15th and early 16th centuries than the Pazzi Conspiracy; the streets were literally treacherous places, and deadly at night. In Rome, even in the 17th century, one was required to have a permit to carry a sword owing to the many incidental sword fights and deaths–one of the reasons the artist Caravaggio was arrested so often. Since the 13th century, the Passetto di Borgo has connected the papal apartments with the stronghold of Castel Sant’Angelo, saving the lives of at least two popes. 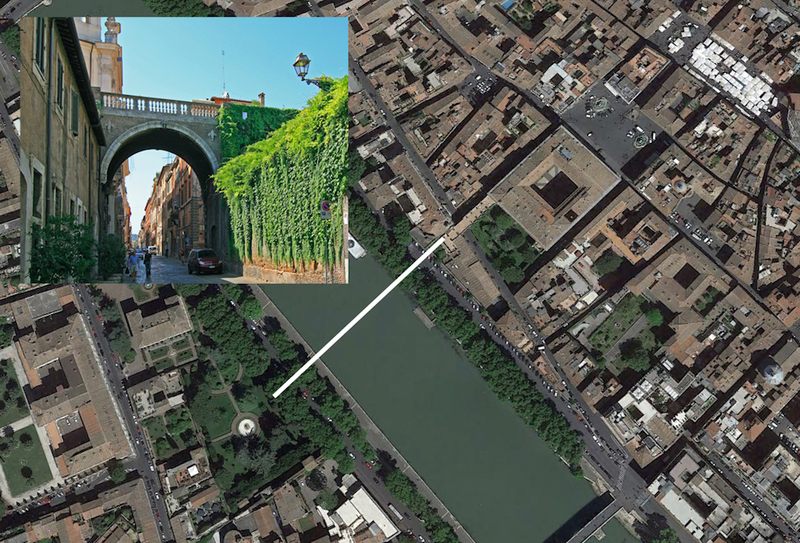 Background Image: Rome, Italy, Aerial View, Detail of eastern quadrant, Campus Martius, showing (in white outline) the un-built bridge for the Farnese family connecting the Palazzo Farnese with the garden of the Villa Farnesina (in what is now Trastevere). Insert: The “Arco Farnese,” Via Guilia, Rome, Michelangelo Buonarroti. Photo: Jensens. 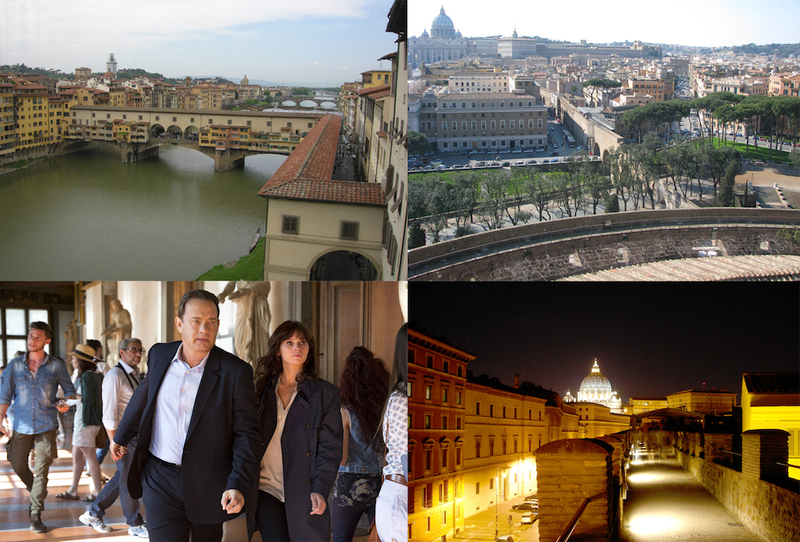 Both the Passetto di Borgo and the Vasari Corridor, heretofore relatively unknown, have helped save Dan Brown’s Robert Langdon in Angels and Demons and Inferno, respectively. The film version of Mr. Brown’s latest book, The Lost Symbol, is now going into pre-production. Had Michelangelo finished the design and construction of the Farnese family’s private bridge spanning the Tibre, connecting their palazzo in the city (the Embassy of France since the end of World War II) with their new villa in Trastevere (Villa Farnesina), I suspect Dr. Langdon would soon find his way across it as well. For someone who has ostensibly lived in one of the greatest cities on the planet for most of his life, Mr. Trump is neither urban nor urbane. Helicoptering from the roof of Trump Tower to his Bedminster golf resort only to fly to Mar-a-Lago hardly qualifies as living anywhere at all. Yes, Mr. President, cities can be dangerous, for Popes, the Medicis, and even a Trump (were one to actually walk a sidewalk). Yet, the carnage that shocked a cold-war-country already on edge, took place not in a city, or even a small town. The crime chronicled in the genre-creating non-fiction novel happened not in a city, but on the Clutter family farm in “a lonesome area that other Kansans call ‘out there’.” Cities don’t kill people; people kill people, in cold blood. Cities are among the greatest of human constructs. Whether one lives on 40 acres of bottomland or a dense city block, we all live in human-made environments of some sort. We owe the character and structure of this to countless unknown decisions made by largely faceless players. Buildings, streets, parks, wetlands, infrastructure, subsidies, signage, codes and zoning ordinances–they are forever present, invariably controlling, limiting, or at least suggesting what we do, how we act and interact. Yet, rarely does one have the opportunity to pause, think, and then think again, about the stuff we have wrapped up so much of our lives in, and daily accommodate. And no, this can’t be explained away by the mass psychosis of 21st-century digital age ADHD. Its arc is long. This is not new. The 19th-century paterfamilias of American Pragmatism, C S. Pierce, argued that everyday human experience–what we would consider the stuff of normal day-to-day living–is nothing more than static. That is, what we tend to think of as consciousness is nothing more than a relatively constant state of distraction. For Pierce, who influenced John Dewey and William James, true consciousness happens at moments of discontinuity–interruptions in this otherwise muddled middle ground we call life. When an unexpected scent sets in motion a tumbling of forgotten memories–think of Proust’s madeleine–this is what it is to be aware, awake, fully in the world. This is what criticism and critical thinking have to offer, whether the topic is architecture or animal husbandry. All the rest is just uninformed ranting about inoperable brake lights, misogynistic state-sanctioned sports nomenclature, and massive insurance avoidance conspiracies. In the third part of this series, I will return to where Part 2 began: the shifting fortunes of Beirut, with a focus on Knoxville. Although Lebanon’s capital, Beirut, gets by with relatively few pickup trucks per capita, it was once both livable and great. Recent developments there illuminate Beirut’s difficult past and stand as a signpost of sorts to those who would invest in the continued reconstruction of one’s own urban center, Knoxville included. 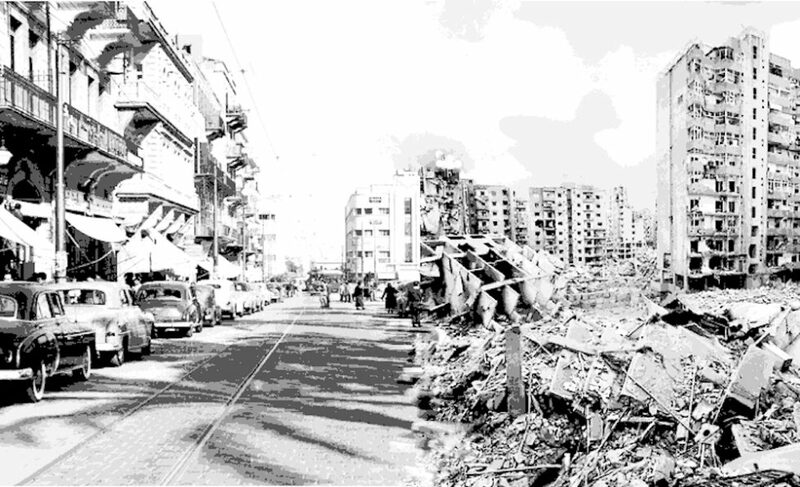 Featured Photo: Beirut, Martyrs Square, postcard circa 1951 and Beirut after Israeli air strike, 2006. Photomontage: George Dodds. George Dodds’ Architecture Matters explores issues concerning the human-made environment, primarily focused on Knoxville and its environs. He has been teaching and publishing commentaries on the practice and history of architecture, urbanism, and landscape architecture for over 30 years. 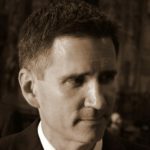 He has practiced in Detroit, Philadelphia, and Washington, D.C., has lectured internationally, and has served on the editorial boards of several journals. Since 2000, he has been on the faculty of architecture at the University of Tennessee. Pro Bono Publico: Why Does a Bank Building Look Like a Suburban House? What Should We Do With the James White Parkway?